Businesses are helping to shape the direction of a national centre of excellence for the bioscience industries, based in the North East. Focus groups are being held to determine the priorities for the new National Horizons Centre. 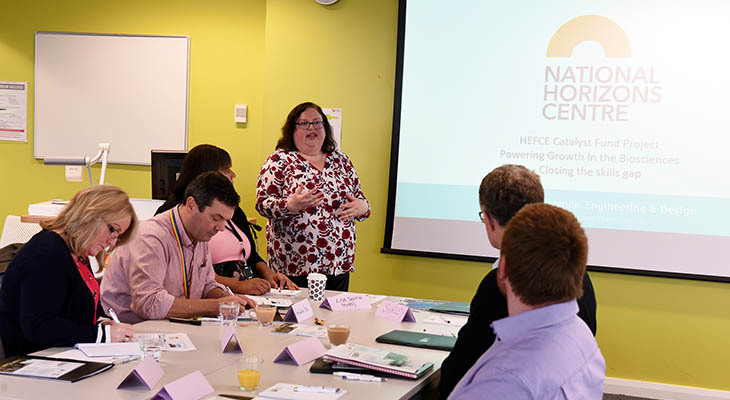 A series of focus groups is being held with key stakeholders to determine priorities for the National Horizons Centre (NHC), which opens in the spring. The NHC is a £22.3m state-of-the-art bioscience education, training, research and innovation facility at Teesside University’s Darlington campus on Central Park. It will house academics and business development staff from Teesside University, working in partnership with regional, national and international industry players including Fujifilm Diosynth Biotechnologies and the Centre for Process Innovation (CPI), to provide specialist education, training and professional development for the current and future workforce, and to promote industry-focused innovation and research. As part of its focus on workforce skills, the University has been working with businesses including Fujifilm Diosynth, Quorn, Hart Biologicals, GlaxoSmithKline, and AstraZeneca UK, to identify current and future skills gaps. The information from the focus groups will be used to develop a series of Continuing Professional Development (CPD) courses which the NHC will offer to businesses. It is fantastic that so many key players in this innovative and exciting sector are already involved, and we look forward to working with even more companies in helping the Tees Valley meet the challenges of the Government’s Industrial Strategy. Laura Woods, Director of Academic Enterprise at Teesside University, said: 'The NHC will play a vital part in the University’s mission to help drive economic growth, here in the Tees Valley and nationally. 'We want to be confident that the NHC directly addresses the industry’s needs. Needs already identified by focus groups include more training on quality assurance and project management, and graduate ‘soft skills’ such as scientific writing and business awareness. Discussions have also been held about industrial skills lacking in the region, and the state-of-the art equipment that will feature in the NHC. The NHC is due to open in Spring 2019. It has been financially supported by the Local Growth Fund, via the Tees Valley Combined Authority, and the European Regional Development Fund. The Local Growth Fund contribution of £17.5m represents the single biggest investment by the fund in the Tees Valley. Businesses are helping to shape the direction of a national centre of excellence for the bioscience industries.